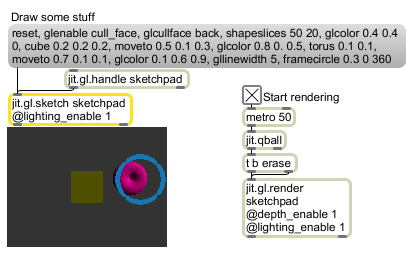 The jit.gl.sketch object records a list of 3-D drawing commands. These commands range from simple turtle graphics to the majority of the OpenGL API. The jit.gl.sketch object requires one argument: the name of a drawing context. A named drawing context is a named instance of a jit.window , jit.pwindow , or jit.matrix object that has an instance of the jit.gl.render object associated with it. This value may also be set via the OB3D drawto attribute. anything The jit.gl.sketch object accepts a list of drawing commands. Draws a circle with radius specified by radius and center point at the current drawing position. If theta-start and theta-end are specified, then an arc will be drawn instead of a full circle. The theta-start and theta-end arguments are in terms of degrees (0-360). The current shapeorient and shapeslice values will also affect the drawing. cmd_delete Deletes index or all instances of the command specified by the command argument from the command list. Enables/disables command in the command list. Inserts command at position index in the command list. Replaces position index in the command list with command . dimorient The word dimorient followed by a zero or one, affects the drawmatrix command. The default is 0.
drawobject The word drawobject, followed by a symbol that specifies an object name and a 0/1 flag that specifies whether or not to ignore the )B3D attributes, draws a named jit.gl object. Draws a box with width 2* scale-x , height 2* scale-y , depth 2* scale-z , and center point at the current drawing position. If scale-y and scale-z are not specified, they will assume the same value as scale-x . The current shapeorient , shapeslice , and shapeprim values will also affect the drawing. Draws a cylinder with top radius specified by radius1 , bottom radius specified by radius2 , length specified by mag , and center point at the current drawing position. If theta-start and theta-end are specified, then a patch will be drawn instead of a full cylinder. The theta-start and theta-end arguments are in terms of degrees (0-360). The current shapeorient, shapeslice, and shapeprim values will also affect the drawing. beginstroke Begin definition of a stroked path of the style specified by a following stroke_style argument. Currently supported stroke styles are "
Draws the circumference of the circle with radius specified by radius and center point at the current drawing position. If theta-start and theta-end are specified, then an arc will be drawn instead of a full circle. The theta-start and theta-end arguments are in terms of degrees (0-360). The current shapeorient and shapeslice values will also affect the drawing. Draws the circumference of the ellipse specified by radius1 , radius2 and center point at the current drawing position. If theta-start and theta-end are specified, then an arc will be drawn instead of a full ellipse. The theta-start and theta-end arguments are in terms of degrees (0-360). The current shapeorient and shapeslice values will also affect the drawing. Draws the frame of the quadrilateral specified by the four points x1 y1 z1 x2 y2 z2 x3 y3 z3 x4 y4 z4 . Draws the frame of the triangle specified by the three points x1 y1 z1 x2 y2 z2 x3 y3 z3 . Draws the ellipse specified by radius1 , radius2 and center point at the current drawing position. If theta-start and theta-end are specified, then an arc will be drawn instead of a full ellipse. The theta-start and theta-end arguments are in terms of degrees (0-360). The current shapeorient and shapeslice values will also affect the drawing. endstroke Ends the definition of a stroked path and renders the path. getcamera Returns the x, y, and z coordinates of the camera location. Sends the command list item at index as a message out the object's right outlet. glalphafunc Please see the OpenGL "Red Book" or "Blue Book" for more information. Please see the OpenGL "Red Book" or "Blue Book" for more information. glbindprogram Please see the OpenGL "Red Book" or "Blue Book" for more information. glblendfunc Please see the OpenGL "Red Book" or "Blue Book" for more information. glclear Please see the OpenGL "Red Book" or "Blue Book" for more information. glcullface Please see the OpenGL "Red Book" or "Blue Book" for more information. gldepthrange Please see the OpenGL "Red Book" or "Blue Book" for more information. glend Please see the OpenGL "Red Book" or "Blue Book" for more information. glfinish Please see the OpenGL "Red Book" or "Blue Book" for more information. glflush Please see the OpenGL "Red Book" or "Blue Book" for more information. glget Please see the OpenGL "Red Book" or "Blue Book" for more information. glloadidentity Please see the OpenGL "Red Book" or "Blue Book" for more information. glmatrixmode Please see the OpenGL "Red Book" or "Blue Book" for more information. glpolygonmode Please see the OpenGL "Red Book" or "Blue Book" for more information. glpopattrib Please see the OpenGL "Red Book" or "Blue Book" for more information. glpopmatrix Please see the OpenGL "Red Book" or "Blue Book" for more information. glpushattrib Please see the OpenGL "Red Book" or "Blue Book" for more information. glpushmatrix Please see the OpenGL "Red Book" or "Blue Book" for more information. glshademodel Please see the OpenGL "Red Book" or "Blue Book" for more info. glunbindprogram Please see the OpenGL "Red Book" or "Blue Book" for more information. glulookat Please see the OpenGL "Red Book" or "Blue Book" for more information. gluortho2d Please see the OpenGL "Red Book" or "Blue Book" for more information. gluperspective Please see the OpenGL "Red Book" or "Blue Book" for more information. glutessbegincontour Please see the OpenGL "Red Book" or "Blue Book" for more information. glutessbeginpolygon Please see the OpenGL "Red Book" or "Blue Book" for more information. glutessendcontour Please see the OpenGL "Red Book" or "Blue Book" for more information. glutessendpolygon Please see the OpenGL "Red Book" or "Blue Book" for more information. Draws a matrix using the tessellator as a set of vertices and colors. Dim 0 represents a single vertex/color. Dim 1 represents a single contour. Dim 2 represents a single polygon. Moves the drawing position delta-x delta-y delta-z relative to the current drawing position. Moves the drawing position to the location specified by x y z . Draws a line from the current drawing position to the location delta-x delta-y delta-z relative to the current drawing position. Draws a line from the current drawing position to the location specified by x y z . Draws a line from the location specified by x1 y1 z1 to the location specified by x2 y2 z2 . Draws a plane with top width 2* scale-x1 , left height 2* scale-y1 , bottom width 2* scale-x2 , right height 2* scale-y2 , and center point at the current drawing position. If scale-y1 is not specified, it will assume the same value as scale-x1 . If scale-x2 and scale-y2 are not specified, they will assume the same values as scale-x1 and scale-y1 respectively. The current shapeorient, shapeslice, and shapeprim values will also affect the drawing. Draws a point at the location specified by x y z .
reset Delete all elements of the command list. Draws the quadrilateral specified by the four points x1 y1 z1 x2 y2 z2 x3 y3 z3 x4 y4 z4 . Draws the triangle specified by the three points x1 y1 z1 x2 y2 z2 x3 y3 z3 . screentoworld The word screentoworld, followed by a pair of numbers that specify x and y coordinates, returns an array containing the x , y , and z world coordinates associated with a given screen pixel using the same the depth from the camera as 0,0,0. Optionally a third depth arg may be specified, which may be useful for hit detection and other applications. The depth value is typically specified in the range 0.-1. where 0 is the near clipping plane, and 1. is the far clipping plane. Sets the current orientation for shape drawing commands (circle, framecircle, ellipse, frameellipse, sphere, cylinder, torus, cube, and plane). The rot-x , rot-y , and rot-z arguments are in terms of degrees (0-360). The order in which the orientation is applied is first rotate about x axis rot-x , then rotate about y axis rot-y , and finally rotate about z axis rot-z . Sets the current level of decimation (resolution) for shape drawing commands (circle, framecircle, ellipse, frameellipse, sphere, cylinder, torus, cube, and plane). Draws a sphere with radius specified by radius and center point at the current drawing position. If theta1-start , theta1-end , theta2-start , and theta2-end are specified, then a patch will be drawn instead of a full sphere. The theta1-start , theta1-end , theta2-start , and theta2-end arguments are in terms of degrees (0-360). The current shapeorient, shapeslice, and shapeprim values will also affect the drawing. roundedplane The message roundedplane round_amount scale_x scale_y draws a rounded plane with width 2 * scale_x , and height 2 * scale_y and center point at the current drawing position. The size of the rounded portion of the plane is determined by the round_amount argument. If scale_y is not specified, it will assume the same value as scale_x . Draws a torus with major radius specified by radius1 , minor radius specified by radius1 , and center point at the current drawing position. If theta1-start , theta1-end , theta2-start , and theta2-end are specified, then a patch will be drawn instead of a full torus. The theta1-start , theta1-end , theta2-start , and theta2-end arguments are in terms of degrees (0-360). The current shapeorient, shapeslice, and shapeprim values will also affect the drawing. strokeparam The word strokeparam, followed by a parameter name argument and a list of parameter values, sets the current value of the parameter specified by the parameter_name argument to be the value specified by parameter_value argument(s). Some parameters are global for the extent of a stroked path definition, while others may vary on a point by point basis. strokepoint The word strokepoint, followed by three numbers that specify x , y , z coordinates, defines an anchor point at the location specified by those coordinates. Some stroke styles (such as basic2d) will ignore the z coordinate. worldtoscreen The word worldtoscreen, followed by three numbers that specify x , y , z coordinates, returns an array containing the x , y , and depth screen coordinates associated with a given world coordinate. The depth value is typically specified in the range 0.-1. where 0 is the near clipping plane, and 1. is the far clipping plane. immediate int Toggles immediate mode. When immediate mode is enabled, a message will be executed when it is submitted rather than on draw. pushstate int Toggles pushing all attrbiutes on draw.